Paddy Irish Whiskey is a triple-distilled blend containing a high percentage of Pure Pot Still. 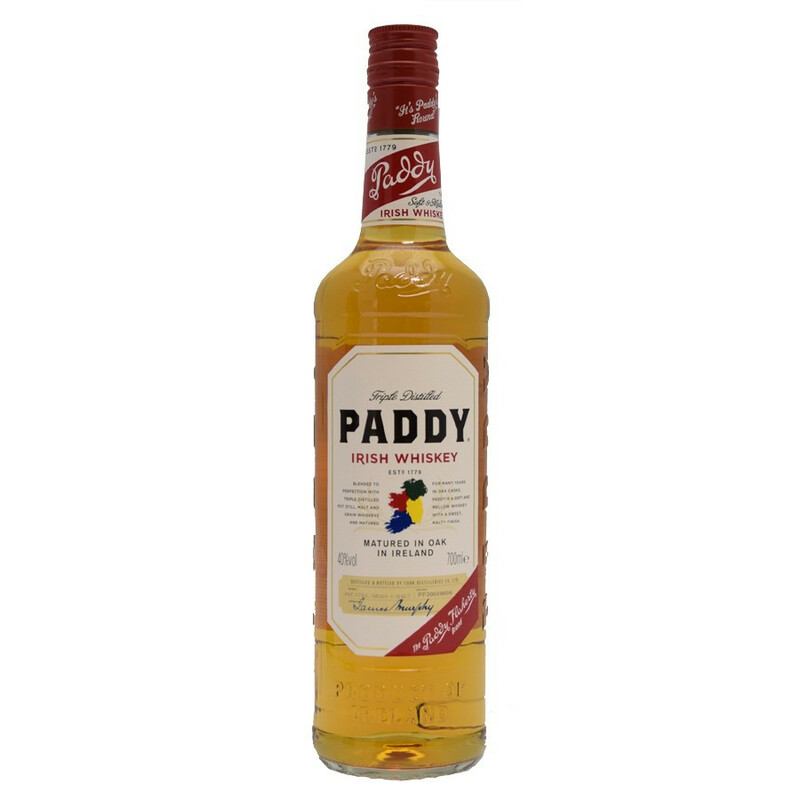 Paddy is a very popular whiskey in Ireland and in France as well, as it is the second best selling whiskey. Paddy is a triple-distilled blended whiskey with a high percentage of Pure Pot Still. It combines whiskies aged for 7 years in oak casks that confers Paddy its typical mellow, fruity and vanilla aromas and golden colour. Distilled since 1779 in Midleton, Cork, South Ireland, Paddy’s history stretches back a long way. Cork Distilleries in one of the first distilleries to ever bottle Paddy whiskey. Indeed, in the 1920’s – 30’s, Ireland, whiskey barrels were sold to wholesalers by the distillery, who would then resell it to pubs. Some intermediaries did not hesitate to dilute the spirit to sell more. To protect the exceptional quality of its product, the distillery launched its own bottling. Paddy takes its name from a commercial agent renowned for his generosity when performing whiskey tastings. Patrick “Paddy” Flaherty was much awaited at the several halts of his journeys. Paddy Flaherty became so popular that pubs and establishments, often out of stock, took the habit of ordering “Paddy Flaherty’s whiskey” to the distillery rather than “Cork Distilleries Company Old Irish Whiskey”. Rolled off the tongue that one. Nifty, the distillery managers mentioned the name of their agent on the label. With time, the “Paddy” mention became the official name of the famous blend. In 1966, Cork Distillers, owner of Paddy, merges with two whiskey production companies, John Power & Son, John Jameson & Son to form the Irish Distillers Ltd. The new directory then closes every operating distillery and concentrates all the production in Midleton. The Midleton distillery had been founded in 1825 by the James Brothers, Daniel & Jeremiah Murphy, who took over and old factory, also used as military barracks. The biggest distillery of Ireland is then built by the Irish Distillers Ltd, close to the old buildings. The production starts again in 1975, with the old distillery turned into a museum. It is today one of the main touristic attraction of Cork Region. Midleton is one of the most modern distilleries in the world. Its production capacity reaches 19 million liters of alcohol a year, with 13 stills working full time to produce all types of Irish whiskeys. Nose : a sophisticated and pleasant blend of citrus (lemon, grapefruit) and spicy notes married with vanilla, honey, woody and slightly malted aromas, for a fresh, light and smooth feel. Palate : round, mellow and full-bodied, releasing its malted, roasted cereal and spicy notes, with vanilla and honey hints. Finish : bittersweet and slowly fading on slightly round malted and woody notes for a lingering pleasure. Paddy may be enjoyed neat or on the rocks to release aromas. It is a perfect whiskey for cocktails and Irish Coffee.